← Top 30 airport in the world renovation renderings feature ArchVision RPC Content. Looking for a new car? How about the economical fuel efficient Hyundai Elantra? Then again one might prefer something a little larger that will handle rough off-road conditions like the Toyota FJ Cruiser. Why choose? Get them both now in the May Cars Additions collection. 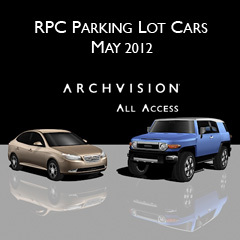 RPC All Access plan customers now have access to these two new RPCs and thousands more. Very useful post. I have recently purchased a new model of Toyota FJ Cruiser.. It is going well still and works good in rough road or even no roads. Shape and design is also good.